I’ve been waiting for this phone for a long time. My previous phone was a Lumia 920 and I got it when that phone was pretty new. That phone is a bit dated now but still works well. I’ve always liked that 920 and the Windows 8.1 Phone OS. In this review, I won’t focus on the official specs of the Lumia 950. There are plenty of places you can look them up and other reviews that focus on the specifications. This review will be based mostly on my thoughts and impressions. My device is an unlocked Lumia 950 in black. I purchased it directly from Microsoft at the Store. I’m at AT&T customer but since I am off contract, I wanted to keep it that way. 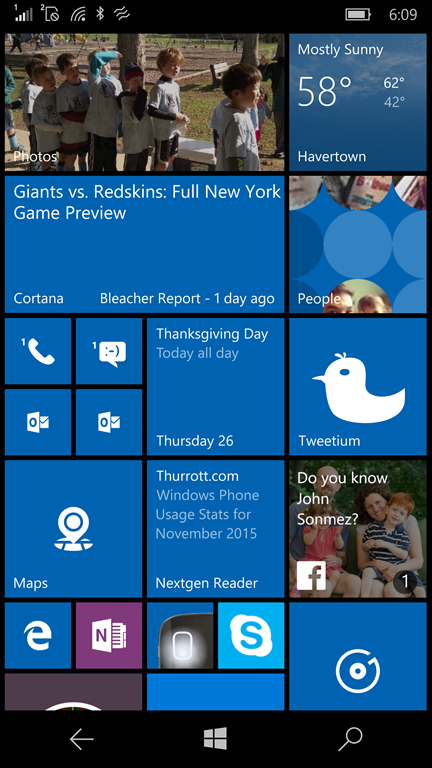 I’ll also include my thoughts on Windows 10 Mobile since that is installed on the 950. Coming from Windows Phone 8.1, Windows 10 Mobile is a big change but still familiar enough to make for a smooth transition. The new OS is far more polished and the UI is refreshed a lot in great ways. Since I did not participate in the Insider program, this is really my first look at the OS. I’m sure I will have more thoughts later. Here are some of my first thoughts. I have always like the actions available to me by swiping down from the top if start. But that menu is much improved now with an expandable/collapsible set of features available. Settings is much improved. Searching settings is a great feature and makes it very easy to use. I’ve always been a fan of Cortana and she is working great on Windows 10. 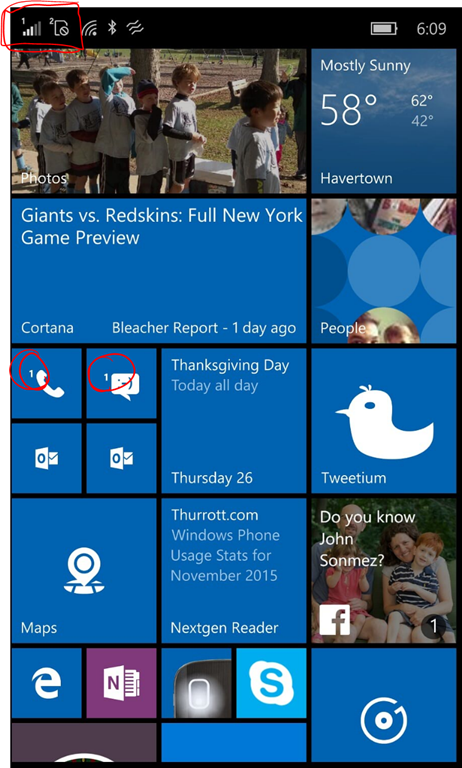 So far there are no new surprises with Cortana but I look forward to seeing how it integrates with Windows 10 Mobile. I did have some trouble setting up Quiet Hours. From the phone you can easily turn Quiet Hours on or off but no way to schedule them. 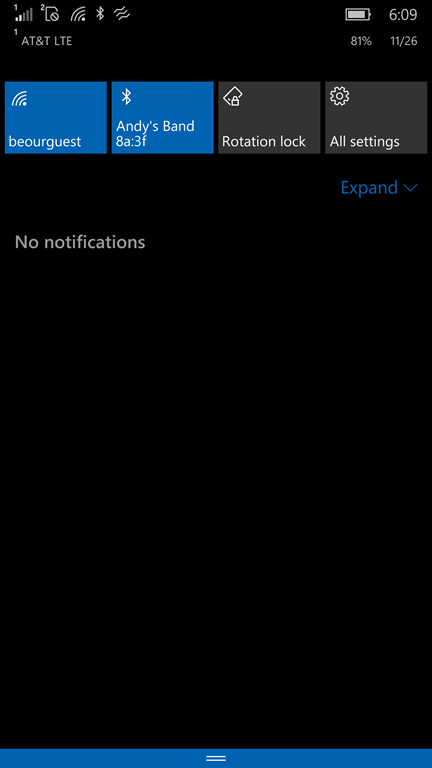 But of course, I forgot that Cortana handles that for me! Another nice feature of the OS is the ease of which you can set where files get stored. Configuring the use of a SD card is easier than ever. I guess I should get around to actually popping in an SD card. My only real issue with Windows 10 Mobile is that I don’t think it is done. I have a feeling they rushed this out the door. Is that a big problem? Not really. But often (in my first day) various settings screens would open and then close immediately. So it is a nuisance. But my assumption is that these items will be patched quickly. I don’t mind the minor inconvenience since, as stated, I have been waiting forever for this phone. One of Windows 10 Mobile’s most exciting feature is Continuum. It sounded really cool to me but I admit I was skeptical for two reasons. First, I was unsure how good the experience would be. And second, I’m not sure how useful it would be to me. Well of course I tried it out right away! I already have a ScreenBeam Mini 2. 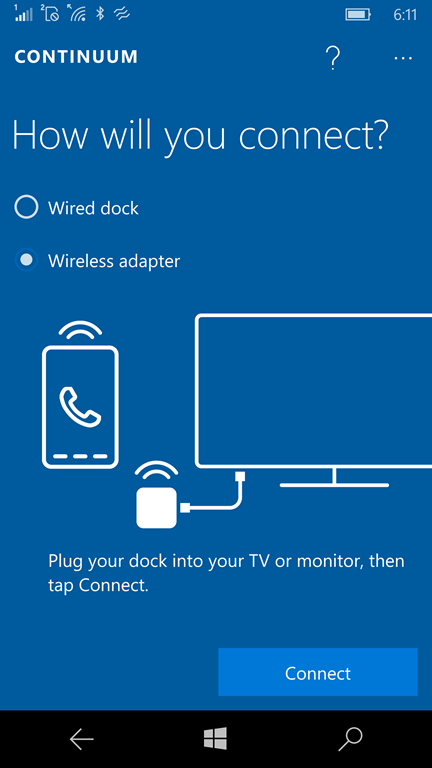 It was super easy to get my phone connected to that via the Continuum app. I also have a little Bluetooth keyboard that goes with my Dell Venue 8. For the mouse, I chose to use the phone as a touchpad. I figured this would give me an idea of usage while “traveling light”. I could always upgrade to a Microsoft Display Dock and better mouse and keyboard. My first thoughts on Continuum – it works really well! There was a slight lag when typing but that was expected with my setup. Basically, it really felt as if I was using a “regular” computer. I played with email and Word and a few other things. The experience was really good. Now, for the big question… will I ever use it again? So far the only answer I have is maybe. I certainly wouldn’t shy away from it. But since I have a lightweight Surface Pro 3, it is not often that I am without a great device to use. And why would I travel with a separate keyboard in my bag vs. my Surface? Windows Hello is Microsoft’s new login mechanism. Since childhood I’ve dreamed up using a Retina Scan to log in to a bank vault or some secret location. Windows Hello seemed as close as I would get for a while. Unfortunately, this was a bit of a let down to me. It seems to work but it is just too awkward and slow. I have heard this works much better on other devices. Hello does recognize me but not all of the time. But mostly, it just seems strange holding the phone up to my face and waiting. If it could recognize me really fast at arms-length it would be awesome but that does not work. I’ll be fair and play with it more but I have a feeling this will be turned off on my phone soon. I really like the size of this device. I’m coming from a Lumia 920 and I expected the 950 to feel a lot bigger. But it doesn’t. It is bigger but it doesn’t really feel bigger so that is great. Part of that may be due to the weight – this phone is much lighter than my 920. Part of its lightweight nature is due to the material used for the back of the phone. I’ve read many reviews that claimed that the plastic back made the phone feel cheap. I couldn’t care less about that. I really think this is a non-issue. To me, the phone is lightweight – that is a big plus. Also, the back is removable and replaceable so I assume you can get a more expensive back for it if you are so inclined. I’m happy as is. Also, I find it funny that many reviewers suggest that the back material feels cheap and users won’t like it. But many users will get a case for their phone anyway. So why would they care? While the size of this device may not feel much bigger, I have a ton more screen real-estate. I can fit so many icons on the start screen. I am really loving that. For me, the size is great. I feel like the size combined with the resolution makes for a great user experience and fits a lot of information on screen. Setup was basically pretty easy. I logged in with my Microsoft Account and I was given the option to copy my old phone’s apps and settings or start from scratch. I chose to copy. So it took a while to install all of my apps but that is to be expected. My start screen looked really funny at first because my Lumia 920 didn’t support as many tiles as the 950 does. I can fit a ton of tiles and it doesn’t look crowded. It looks really cool, I think. Organized and slick. 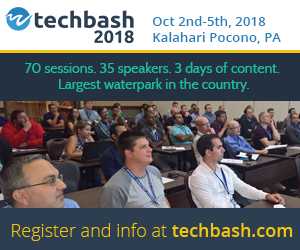 After the initial setup process I spent some time arranging the start screen, configuring email and calendar accounts, and more. Really a very simple process. The only problem worth noting, in case it helps someone else prepare, was the need for a Nano SIM card. My old phone’s SIM card was not compatible with this device. So while at the mall I went to the AT&T store. As much as I dislike that store, it was pretty quick and easy. The staff quickly got me set up with a new SIM Card at no cost. As stated earlier, I won’t get into actual specs. I’ll just tell you that this screen is beautiful. As important as the insides of the device are, the screen is what you see, what you use. Touch feels great. Details look sharp and the colors are crisp. The screen is bright. Of course, I haven’t had a chance to try out the 950 in a variety of locations, like the beach for example, but my first impressions are that the screen is beautiful. The camera is probably the feature that I was most excited to try. I’ve been trying to read up on the features and capabilities as much as possible and I need to continue doing so. I really want to get the most out of this camera. I had heard good things about the camera’s ability to take low light shots. I took a few pictures inside with no flash and dim lighting. I really was shocked at how good the resulting images were. This is really impressive. I’m very impressed with Rich Camera. With this feature, the camera actually takes multiple pictures and allows the user to to adjust the images later. Wow… again I am really impressed. I definitely need to play around with the camera. I’m also excited about the Living Image feature that takes a bit of video before a picture. Sounds like you can use that to make really nice montages and slide shows. Yeah, Windows 10 Mobile is short on apps. We know that already. However, the new mail, calendar and other default apps are really nice and much improved. This phone comes ready for 2 SIM Cards. I only have 1. I find it a bit annoying that the phone and text tiles each have a little “1” on them to indicate which SIM card they are for. But I keep seeing the “1” thinking I have 1 text message waiting for me. I’ll probably get used to that. Speaking of 2s, the phone came with 2 USB-C cables. One that is USB-C to full size USB. Another that is USB-C with a power plug on the end. That was a small but added bonus. I love the idea of a removable battery. And of course, allowing for SD card expansion is a great thing. selection of cases and back. My 920 had hardware buttons for “back”, “Home” and “Search”. The new phone does not. The 950 has software buttons for these actions. That is taking me a bit of time to get used to but I have a feeling that this is a better set up. Well, this should be no surprise to anyone who knows me. I love this phone. Some may say that there are better phones out there. 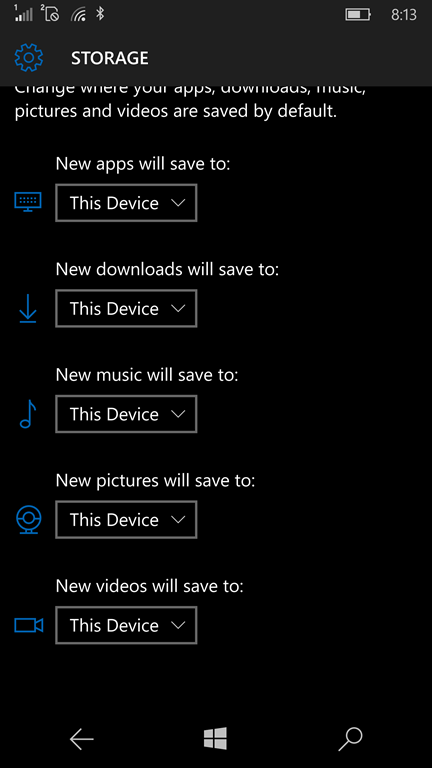 Certainly there is an issue with available apps for Windows 10 Mobile. But I’ve been “All In” with Microsoft stuff for a while now. I am holding out hope that the platform gets more popular and the apps come. The truth is, I’m not desperate for any apps (right now). 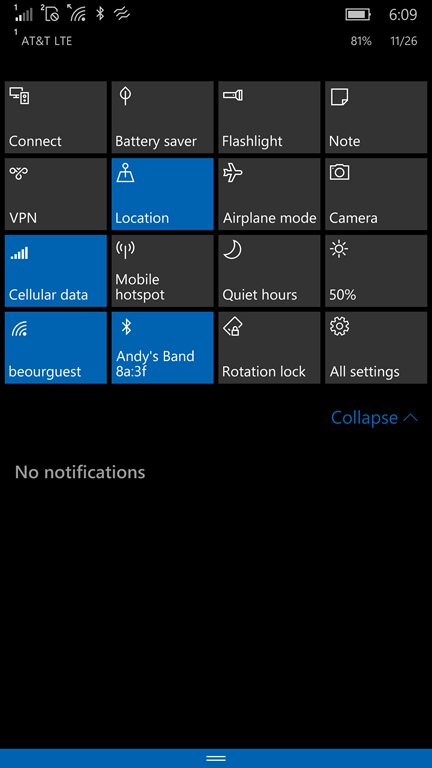 Having a Windows based phone is great for me because it works and syncs well with my home pc, my Surface Pro 3, my usage of One Drive, OneNote, and now my new Band 2. If you have a Windows Phone already, I wouldn’t hesitate from getting this device. Posted in Microsoft, Technology, Uncategorized, Windows.